Location: Merriman is located on Hiway 20 on the west edge of Cherry County. 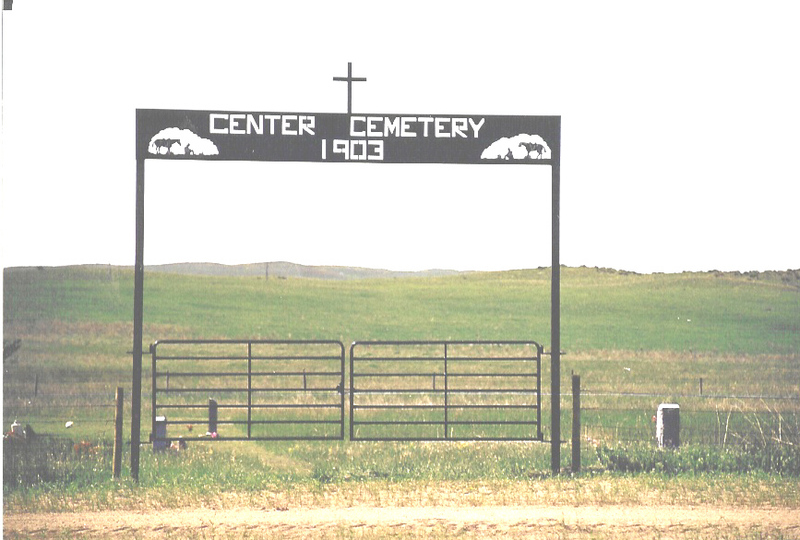 To reach the Center Cemetery, you go south of Merriman on Hiway #61, 10 miles to the south side of the river and just past the top of the hill, you turn on the main road and go west 2 miles. Section 36, Range 38, Township 33. Dalhgrin, Arthur(hus of Minnie Dehm)(son of Son of Edward & Rachel) 12-12-1879 07-19-1915 Mo. Dahlgrin, Lewis E.(hus of Lillian Carter)(son of Edward & Rachel) 01-06-1878 02-14-1919 Mo. Dahlgrin, William Leonard(father)(hus of Lora Agnes McNamee m. 09-06-1891) 02-11-1871 10-30-1929 New Hampton, Mo. McCray, Charles R.(son of Milton G. & Lora Harrison McCray)(husband of Elanor L. Adams m.01-1951) 03-28-1907 06-27-1979 Bethany, Mo. McCray, Eleanor L. Adams(wife of Charles McCray)(dau of Fredrick & Alice Adams) 04-26-1919 05-31-1987 Boston, Ma. Shelby, Joseph(hus of Elizabeth Ann Vickery m.1871) 01-11-1847 11-1927 Fort Wayne, Ind. We apologize for any er rors in reading or transcribing of information. For corrections, please contact the Cherry County Coordinator. Information on births and deaths donated by Ruth Harms of Valentine who walked the cemetery in 1974 & Ken Moreland caretaker of Center Cemetery, 06-02-2000. Phone # 308-684-3409.Picture & cemetery sign donated by Ken Moreland.